Popotla isn’t a restaurant. It’s a fishing village, a beach and a bit of a tourist trap clinging to the Baja shoreline behind a decrepit arch. It is one of northern Baja’s best-kept secrets. Approaching Popotla, a handful of kilometers south of the Rosarito Beach Hotel, you could be forgiven for focusing on the Black Pearl (a ship from the Pirates of the Carribean movie) sitting on the Baja Studios lot at the water’s edge. But that’s not the good stuff. You don’t get to the good stuff, of course, without dodging some hazards. There’s the guard asking for a “voluntary” donation; the pay parking lot—when free and safe spots are at the studio wall; and there there’s a restaurant barker (disregard his advice). Avoid those hazards and, instead, go down to the beach to a seaside, seafood wonderland. There are stalls of fresh snapper, yellowtail, shark and more; fishing boats laden with spider crabs pulled from the sea hours earlier; and there are tables of clams—enormous white pismos, brown chocolatas and smaller black and white pata de mula—few of which ever hit U.S. markets. All are available for sale, all good choices and all delicious. But go past those, too, into a zone of the beach seemingly reserved for the locals. That’s where you’ll discover a dizzying warren of beachside “restaurants.” It’s not always clear where one ends and another begins—that means you’ve found the good stuff. 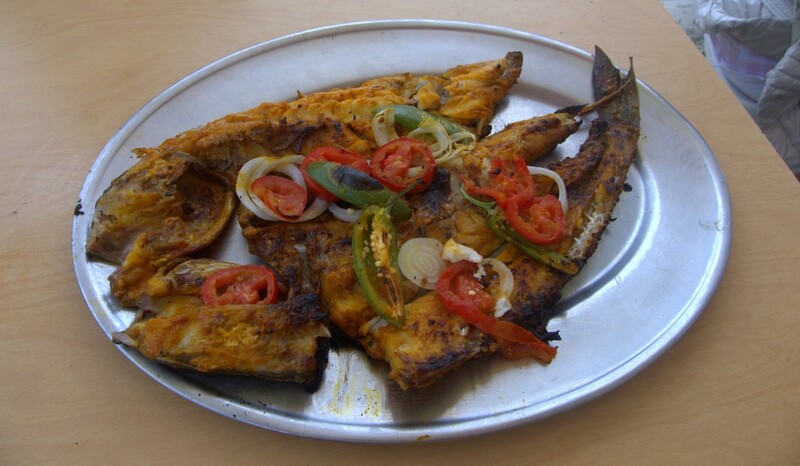 Try, for example, the pescado zarandeado at Mariscos Las Compadres about halfway down the beach. The name of the dish translates a bit poetically as “shaken fish.” A whole butterflied, gloriously fresh fish grilled inside a grate after being painted with a mixture—mayonnaise, butter, achiote and spices—which keeps the fish unbelievably moist as the cook periodically rotates (hence the name) the fish in the grate. Pick the juicy, sweet white flesh off the fish and pop it on a tortilla with salsa and a squeeze of lime. There may be no better grilled fish available on the planet. Or, go a bit further down the beach. As you approach the baños you’ll find El Ray, a ceviche stand operating out of an old boat hull. The aguachile (raw shrimp in a spicy lime sauce with cucumber and onion) is excellent, if not for the heat-averse. Oysters or pata de mulas in the shell are so fresh that even a squeeze of lime and a few drops of hot sauce are purely optional accompaniments. Or, a coctel de almeja (those fresh, raw pismos you just walked past with red onions and cucumbers in clam and tomato juice) could well be your best choice. The closer seafood is to raw, the better. And Popotla offers some of the best. A cold beer, fresh mariscos and sand between your toes—all to the dulcet tones of the surf (or mariachis)—and even the wandering trinket vendors don’t bother you. What was that bit about a movie studio nearby?